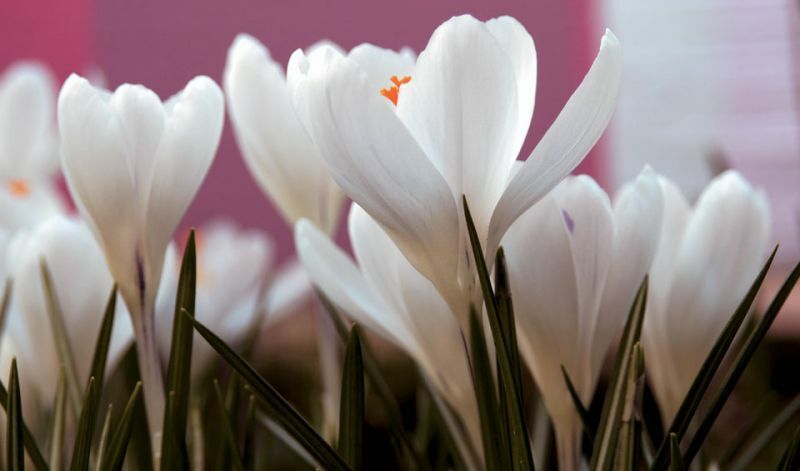 With the largest flowers of any crocus, Dutch crocus look beautiful when planted in individual or mixed colors. They grow well in lawns (where they are also difficult to reach for those pesky squirrels!) but if you want them to come back in future years you will have to wait at least six weeks after blooming before mowing the grass. Their calyx-shaped flowers open only when there is lots of light and stay closed in rainy heavy overcast weather and at night. Their narrow leaves have a silver-grey stripe down the middle. In borders, rock gardens, lawns, under trees and shrubs and suitable for indoor forcing. 'Flower Record' (shiny violet-mauve), 'Grand Maitre' (lavender-violet), 'Jeanne d'Arc' (pure white), 'King of the Striped' (violet with lighter stripes), 'Pickwick' (very pale blue striped and white) and 'Remembrance' (deep blue-violet).